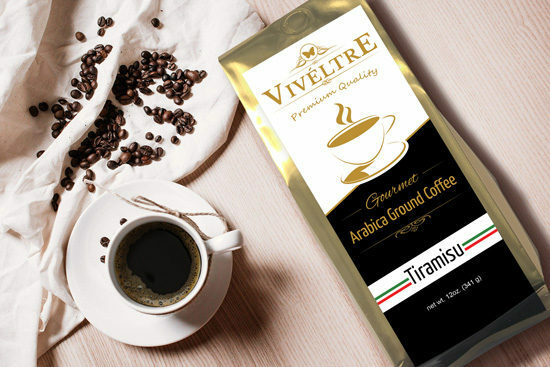 Viveltre has created the ultimate gourmet flavored coffee for lovers of the Italian dessert, Tiramisu. This dessert flavor combines the flavors of vanilla, chocolate, with undertones of rum and amaretto. The word Tiramisu means “pick me up” and that’s exactly what this delightful blend will do for you! An enticing aroma and indulgent taste make this light roast blend a flavor you do not want to miss out on! Viveltre’s gourmet flavored coffee uses a light roast of Arabica, which allow the flavors to shine. Viveltre gourmet flavored coffee is locally brewed in small batches to ensure the highest quality and attention to detail. Viveltre gourmet flavored coffee uses green coffee roasters in an effort to reduce our carbon footprint.